Pro Cycling Manager 2018 has been released, and here are some news updates relating to the new game. Not bought it yet? You can still buy it from Gamesplanet, with each purchase helping to support the site. In Multiplayer mode, it is possible to join a clan. We have created one for PCM.daily, so please join! We'd like to be able to play some community online games this year, and the clan will help with organising that. Already, the race sponsorkit pack from Jacky Durand has been released, containing graphical files for over 420 races. See the thread more information, and download it here. As announced yesterday, we have made a Lite Pack available for PCM18. It can only be downloaded here, but we have also uploaded the CDB to the Steam Workshop. Please consider subscribing to the pack on Steam as well, to help raise awareness of the PCM.daily DB amongst the wider PCM community. The Mountain Lion won our contest to win a free copy of PCM 2018, while Andre Greipel has been voted as the site's favourite cyclist. We've now launched a graphics contest, aimed at those who have not made jerseys before. Find out more here. Have you ever wanted to create your own jerseys, but you have little experience or none at all? Then this contest is the ideal platform for you! During this contest you will be able to learn and master new techniques and at the end of the line you'll be able to create awesome jerseypacks! PCM.daily’s Database Team is very pleased to present the PCM.daily’s Lite Pack 2018. We are aware that this is not as extensive as the Lite Pack we released last year, which is due to not having the same base to work with compared to previous years as we had no 2018DB. But there’s also some good news. For example, we’ve managed to add real equipment to the Lite Pack for the first time. Along with that, it contains everything a realname database has and some more surprises. Read more to check out the full list of features. Download PCM.daily's Lite Pack here! Win Pro Cycling Manager 2018! There's still time left to enter Round 1 of our game, to win a free copy of Pro Cycling Manager 2018, courtesy of Gamesplanet. Can you name the most popular answers to five cycling questions? For more information, see the thread. Updated PCM 2018 pre-order price from Gamesplanet! 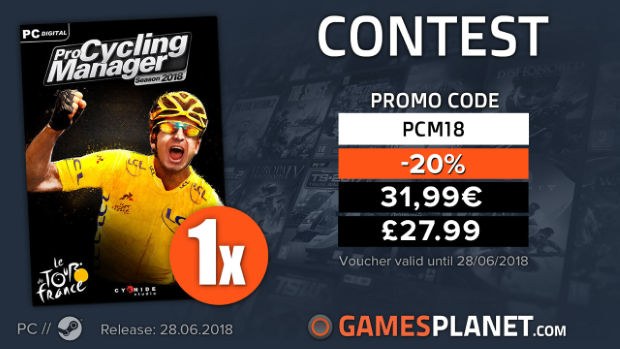 Gameplanet have provided us with an additional discount code for the Pro Cycling Manager 2018 game, which is released this Thursday! (June 28th). You can now get 20% off, and by ordering it through the Gamesplanet link, support PCM.daily at the same time! This offer will only be available until the game's release on the 28th.